Raymond Williams Professor of Communication at the Annenberg School of Communication at the University of Pennsylvania Dr Barbie Zelizer took issue with the framing of a ‘crisis of journalism’ for her keynote address to the Journalism Education and Research Association of Australia conference in Sydney today (November 25). She said notion of a crisis in journalism was a culturally determined phenomenon anchored in the Enlightenment. She drew on definitions of crisis as disruption, suddenness, loss, urgency and helplessness. The label of ‘crisis’ could change murky developments into a manageable phenomenon. “Crisis is a temporarily defined moment,” she said. “Crisis is identifiable, finite, something that can be grasped, treated and controlled. It gives us a sense of closure. “As an institution journalism has always had an affinity with a certain kind of modernity,” she said. She argued the discipline of journalism studies developed because it needed to challenge traditional narratives of journalism. There was a reliance on a modern Anglo-American mindset and crisis offered a way out of murky, out of control challenges. The gravitation to ‘crisis’ followed a pattern of how journalism had traditionally talked about itself. She asked whether journalism’s mass audience ever as mass as assumed and whether there had ever had been agreement about what journalism is or is for. Earlier points in time such as the development of radio, the wire photo and television presented challenges and disagreements. “There is value in both rupture and in continuity,” she said. These narratives see crisis as resolvable or apocalyptic. “All of this is a long way of saying today’s journalistic environments are contingent and diverse,” she said. 3. We assume an overturning of value – what was once seen as central (the newspaper, objectivity) is now seen as toxic. “Uncertainty is ours to live with not to control or eradicate,” she said. Uncertainty is ours to live with. #jeraa2014 @bzelizer 'if you aren't in over your head how do you know how tall you are?' Eliot. #jeraa2014 @bzelizer Shared rubric neutralises differences between different styles of journalism – discourse focus too much on US style. Music and poster art provide alternative news sources in censored news environments Barbie Zelizer #jeraa2014 @utsresearch and theatre? 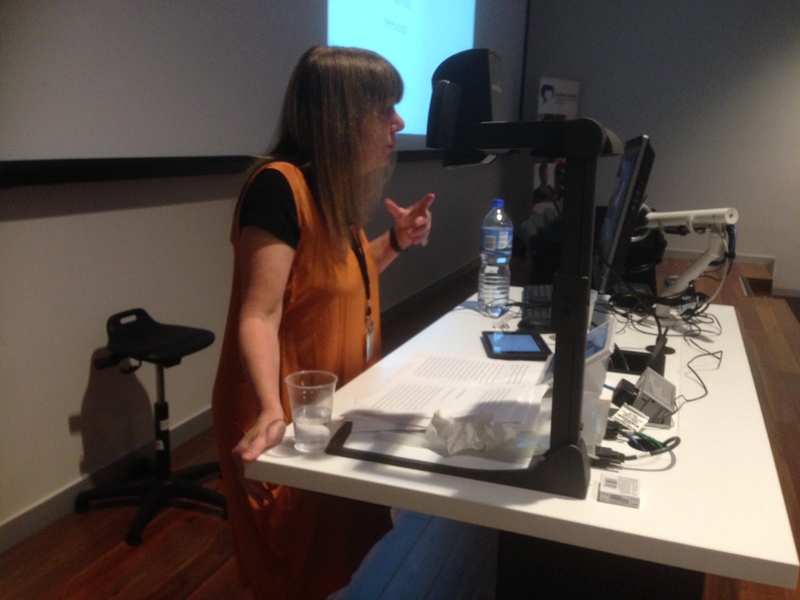 #jeraa2014 Keynote speaker Barbie Zelizer 'On the crisis in journalism'. Crisis – frames what we are talking about in familiar ways.